For a while, it looked like today’s National Championship game would be an anticlimactic finale after both semifinals went to overtime on Friday. Mississippi State led Notre Dame 30-17 at the half, holding the Irish to just three points in the second quarter. But Notre Dame fought back and gave us another instant classic. With the help of an amazing final shot, they won, 61-58. It was junior guard Arike Ogunbowale—the hero of the UConn upset as well—who made that shot. 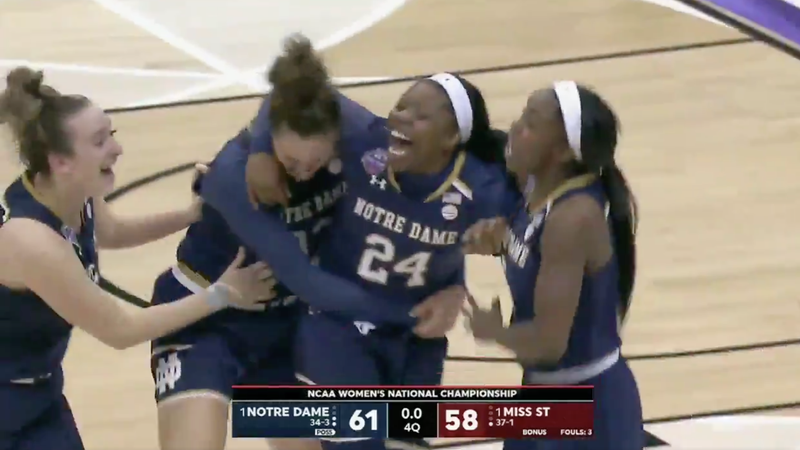 Ogunbowale shot a very bad 5-for-20 from the field, but her 15 points were a crucial part of the Irish comeback, with none more important than her three-pointer with 0.1 seconds left on the clock. The title game was a grind-em-out affair decided more by toughness, intelligence, and defense than the great offense of Friday’s fantastic doubleheader, but Notre Dame outlasted the ugliness to be crowned champions for the second time ever. And despite some great play from the dominant Teaira McCowan, who had 18 points and 17 rebounds, and senior guard Victoria Vivians, who scored 21, the Bulldogs walk away defeated in the title game for the second straight year. It’s no consolation for the heartbreak Muffet McGraw’s Notre Dame team dealt them tonight, but this newly successful MSU program has a very bright future. At the very least, they were part of perhaps the best Final Four ever.